WWF assesses the 20 largest Swiss pension funds for sustainability. 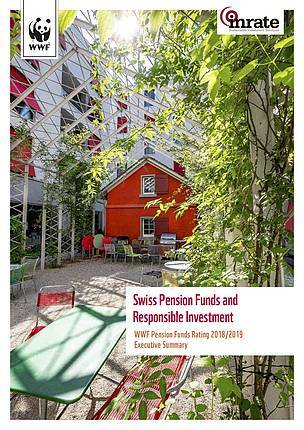 Following the previous rating in 2015/2016, this new study, conducted by WWF Switzerland and Inrate - an independent sustainability rating agency based in Switzerland - assesses the sustainability of pension fund investments and the level of information provided to beneficiaries. While the rating shows that most of the pension funds examined consider sustainability, only a few pursue a comprehensive approach that integrates environmental, social, and governance-related aspects into investment processes and decisions. This means that the majority of the 20 largest Swiss pension funds could still do significanly more to transform their investments and support a sustainable future. Even pension funds classed as 'Best practice' need to go further, especially in regard to measuring the sustainability impact of their investments as well as the systematic integration of sustainability factors. The rating provides a market overview and offers an impartial assessment of the current state of responsible investment in occupational pension plans. It highlights the urgent need for action and contains clear recommendations for Swiss pension funds. The sustainability of the financial sector is a strategic priority for WWF, and WWF Switzerland is now engaging Swiss pension funds and key stakeholder groups in further dialogue to promote responsible investment and sustainability in the second-pillar pension system. Story covering the rating study on Swiss television - part of the business broadcast 'ECO' on SRF (in German), February 4th 2019.